Who's better?. . HD Wallpaper and background images in the Leyton vs. Brucas club tagged: one tree hill brucas leyton lucas brooke peyton chad oth. 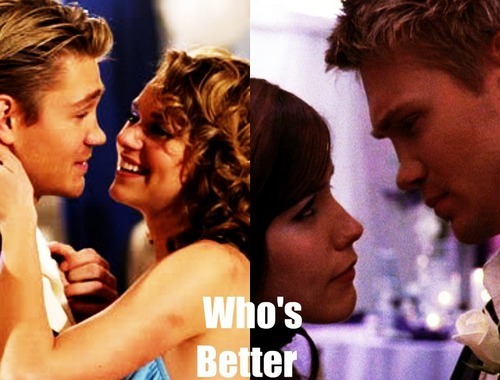 This Leyton vs. Brucas fan art might contain picha, headshot, and closeup. Brucas all the way! Just watch one scene with them and the first thing you will see is their amazing chemistry! LEYTON hands down! yes, BL had their moments that some would call "cute"... but they were never written, or meant to last. just teen puppy love IMO. as opposed to LP... who were endgame for a reason. because their love and relationship was strong/secure enough to make it past high school! leyton = depression... pfff sorry... i hate leyton. Brucas have more deeper scenes in my eyes. But meh let Peyton have him.